FREMONT, CA -- (Marketwire) -- 01/28/13 -- GammaTech Computer Corp., a major international manufacturer and supplier of innovative notebook and tablet computers, is set to introduce its latest rugged tablet designed and engineered for demanding applications such as those found in the utility industry. The high-end unit, model TA10, features a 10.4" display with high performance CPU, ultra-high brightness LCD, and Intel Ivy Bridge processor. It will be a key product in the company's booth (#429) at the DistribuTECH Conference and Exhibition in San Diego from January 29-31. "We are delighted to be able to introduce our new Durabook TA10 rugged tablet at DistribuTECH, the utility industry's leading smart-grid conference and exposition," commented Jen Chen, GammaTech president. "This new tablet makes perfect sense for utility workers out in the field with its ultra-high screen brightness for easy viewing. Its ruggedness and durability stand up to virtually any harsh environment. Its mobility factor is enhanced with Bluetooth and Intel WiFi wireless connectivity as well as an optional internal GPS function." The unit features a 10.4" XGA TFT LCD display with LED backlight. A resistive multi-touch panel with tempered glass is included for enhanced viewing of drawings, files, and web pages. Display options include a sunlight readable panel and a digitizer with active stylus. The TA10's two six-cell battery packs provide longer battery life. For easy in-the-field identification and tracking purposes, the unit comes with an optional UHF RFID reader and Barcode scanner. Optional accessories include a handle, hand strap, and docking station. Security is always a concern with computers used in off-site locations. For that reason, the TA10 boasts features such as TPM 1.2 data security technology, Kensington lock connector, and Intel anti-theft technology (AT) or Computrace asset management and data protection. A FIPS 201 fingerprint scanner for digital imaging of fingerprint patterns is also available. The new GammaTech rugged TA10 tablet comes with the option of either an advanced Intel Ivy Bridge i3-3217UE or i7-3517UE processor. Both provide outstanding performance, lower power consumption, and a smaller footprint. Its mobile Intel QM77 Express Chipset provides integrated USB 3.0 protocol on a single-chip architecture while offering enhanced manageability and security. Storage sizes of 320GB, 500GB, or 750GB are provided with the 2.5" HDD. Also available is an optional 64GB or 128GB mSATA SSD. In addition to the utility industry, the TA10 is an ideal solution for other applications such as the military, public safety, manufacturing, warehousing, distribution and transportation, mobile POS, and construction industries. 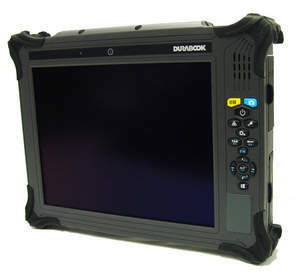 The GammaTech Durabook TA10 rugged tablet will be available through authorized resellers nationwide and on the GammaTech website February 2013. It has an MSRP starting at $2,300 and, as with all GammaTech products, may be customized to customer specifications. GammaTech has a well-earned reputation and a long history in producing computers for the rugged market. It has been named a winner in Government Security News' Homeland Security Awards in the Best Rugged Computers category multiple times. All products/services and trademarks mentioned in this release are the properties of their respective companies. © 2013 GammaTech Computer Corporation. All rights reserved.